Both Preet Banerjee at the Globe and Mail (see also his Lap of the blog) and Jonathan Chevreau at the National Post have written recent articles recommending that DIY investors use financial advisers. I chose to step out completely on my own a few years ago, moving all our assets from full brokerage accounts to DIY discount brokerage accounts–the transfer fees were all paid by the receiving firm as a incentive to move our assets. That was February, 2007. Since that time, our retirement accounts are up a total of 154%. I have also done well in our TFSA’s (up 40%) as well as our non-registered accounts. Thus, I am not in the least tempted to follow their advice because I am confident that I can do well without a financial adviser. (1) Financial education: I’ve learned through reading as much as I can from blogs and internet Newspapers including the Financial Post and Global and Mail financial page. I’ve a limited number of books. Benjamin Graham, The Intelligent Investor and Neill Ferguson, The Ascent of Money. This is time consuming work, and those who don’t have the desire or the time to do it, should probably stick with index funds or a full-service financial adviser. I’ve also occasional taken advantage of seminars or webinars to increase my knowledge–but these can be expensive so I am careful about them. (2) Control of cash flow and leverage: It is important to understand and control cash flow. For example, it is probably a bad idea to buy a momentum stock using leverage. You can never tell whether it is going to go up or down and the hold period may be much longer than expected. By the time it goes up, the return may be greatly diminished by the interest paid. However, it is much safer to use leverage to buy a dividend stock–as it can cover or exceed the interest rate during the entire period that it is held. (3) Accurate tracking of results: I keep track of such things as total net worth, total net sales of stocks, total value of stock portfolio and its net gain or loss, total debt to equity ratio, and the total amount invested in each sector (e.g., oil & gas, mining, food, banks, cash-GIC-bonds). This makes it possible to know whether my strategies are effective or losing money and it helps me to manage risk. (4) Specialization. I can’t know everything about every sector. So I invest most heavily in the oil and gas sector and am becoming more comfortable with how to evaluate the risk of buying into an energy company. I do rely on published reports by professional analysts (at TD Waterhouse and Scotia Capital). (5) Familiarity with different trading and investing strategies. I use the following strategies: Averaging down, selling of cash covered puts, and value investing–particularly the attempt to buy companies close to book value, a.k.a. shareholder’s equity. (6) Control of emotions. The best investors are probably not always geniuses; it is probably incorrect to say that the reason Warren Buffet succeeds is because he is smarter than everyone else. Rather, it is his ability to control fear and greed. He can bring himself to buy when everyone else is selling and to sit on cash while everyone else is buying. A DIY investor must be cool and collected and must be able to buy into market when all the numbers are red and sell in a market where all the numbers are green. 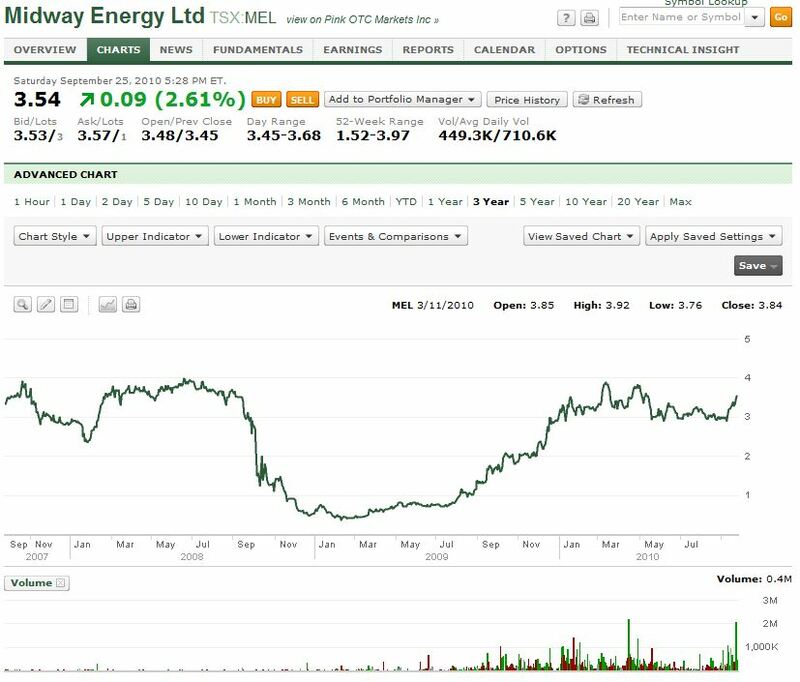 My most successful move was averaging down on a company whose book value per share was $3.40 but its market price had dropped to a tenth of that: that was Trafalgar Energy (now MEL). One day it fell so low that I called their office in Calgary and the investor relations guy said that they were still generating positive cash flow. So I overcame my utter fear of loss and bought thousands of shares that day and the next. It turns out that it may have been the trade of a lifetime.